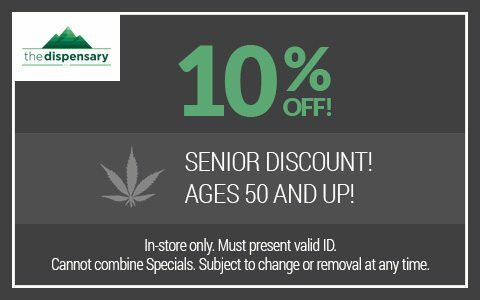 If you’re a senior citizen shopping for cannabis or cannabis products, we’ve got an incredible offer for you! Getting older has its perks, to be sure. Growing old with the one you love. Watching your children grow up. Meeting your grandchildren and loving them more than words can say. But the unfortunate effects time has on our bodies can’t be forgotten. As we age, there are many physical, mental, and emotional problems that can arise. These things can add up, really taking a toll on the golden years for many seniors. To reduce these burdens, many older individuals find themselves reliant on prescription medication. But such a prescription regiment can actually have its own effects on a body and mind. Fortunately, cannabis can — in many situations — be taken in place of many prescription medicines, including pain medication, anti-depressants, stimulants, and sleep aids. Always speak to your doctor before ceasing to take any prescription medications. But know that products like those sold here at The Dispensary NV are 100% an option for what ails you. They can not only serve to replace certain medications but have actually been shown to improve the efficiency of many types of prescriptions. If medication alone isn’t getting the job done, come to The Dispensary NV nearest you! We have three locations in Nevada for your convenience — Las Vegas, Reno, and Henderson — and our knowledgeable staff will be more than happy to help you find the right products for you. Aching bones and joints, headaches, depression, and sleeplessness may soon be a thing of the past. And our team here at The Dispensary is here to help you make that happen. Come with a valid ID or a doctor’s recommendation and we’ll have you on your way with the right products for your tastes and needs. Choose from our wide variety of products, including flowers, concentrates, edibles, topicals, pre-rolls, and more! For any questions about our products or cannabis laws in Nevada, view our FAQ page online or speak with a member of our team today. We’re here to help you feel better, and to ensure you enjoy your experience with The Dispensary and our products. And now, customers 50 years of age or older can get 10% off when you shop with us. This offer is available in-store only, and cannot be combined with other discounts. To take advantage of this deal, simply present this coupon and a valid ID upon checkout at any of our locations. We look forward to your visit!